Tinahely Arts Group (TAG) is a collective of artists and craftspeople, all living and working in the Tinahely area. Formed in June 2010, the group seeks to share knowledge and techniques, pool resources, and work together on projects to promote awareness of the wealth of creativity in our region. In addition, members combine to ensure that the arts and crafts heritage of South Wicklow is visible in as many local events and tourism initiatives as possible, and to contribute their talents to community-enhancement projects. Our members and their work represent a wide and diverse range of disciplines and media, including painting and drawing, photography, sculpture, textiles and ceramics, glassware and metalwork. Members include professional artists making a full-time living from their craft, as well as more casual or part-time artists, teachers and students. We meet regularly to discuss our techniques and ideas, and the group was launched with a very successful joint exhibition on Culture Night in September 2010, at the Riverside Business Centre in Tinahely. New members are always welcome. Visit http://tinahelyartsgroup.wordpress.com/ for more details on how to get involved. FLEETING FOREST ART: Tinahely Arts Group are creating Fleeting Forest Art in Tomnafinogue Woods, Tinahely . We will make Fleeting Forest Art in the woods and hope many people will join us on the day or enjoy our work in the days, weeks and months after. TAG will leave art in the woods that is created only using small materials found on the forest floor. No outside materials will be brought in. The forest changes every minute. Winds blow and leaves fall; animals leave their track; rain comes and washes away… The art pieces will be transient, ephemeral… fleeting. Join us!The details of the project can be found on TAG’s website. For the rest of the summer, the eye-catching sheep and their lambs will be situated out and about in Tinahely, along the looped walks, at the Railway Walk and in unexpected locations around town, to be enjoyed by residents and visitors enjoying our wonderful location and outdoor pursuits. 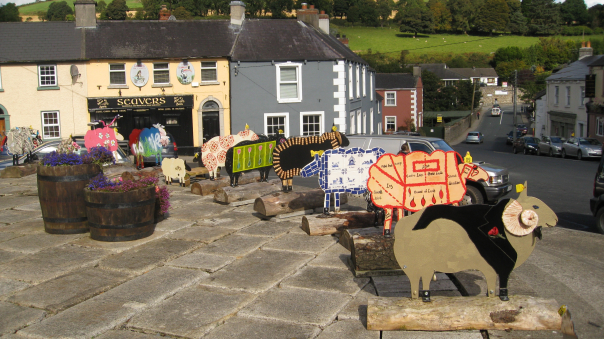 In the autumn the sheep will return to the Market Square, and will be taken home to over-winter with their artist owners. It is hoped that they will increase and multiply over the winter, as well as getting some refurbishment if needed, and will return to the roads and hills around Tinahely as an annual event. TAG are also planning many future projects including arts and crafts workshops and peer learning opportunities; establishing permanent and temporary exhibition spaces for art in and around Tinahely; setting up workshops spaces and sharing promotional tools to expand awareness and marketing of local artistic products; and providing creative input into upcoming Tinahely Community Projects including artwork in and around a community playground and recycling centre, creating an enhanced artistic identity for the community and encouraging more participation and collaboration between local groups, individuals and artists. Details of TAG and our members can be found on the group’s website at http://tinahelyartsgroup.wordpress.com. For more information you can e-mail the committee at: tinahelyartists@gmail.com. Individual bios and photos can be made available through the committee, and the Tinahely Sheep Flock project will be documented in images, words and video. Committee: Irene Lundgaard (Chair), Tina Mouritzen (alternate Chair), Roisine Flood (Secretary), Mark Ryan and Maree Hensey (Treasurers), Christien Van Bussel, Simon Dalton, Maeve Hunter.